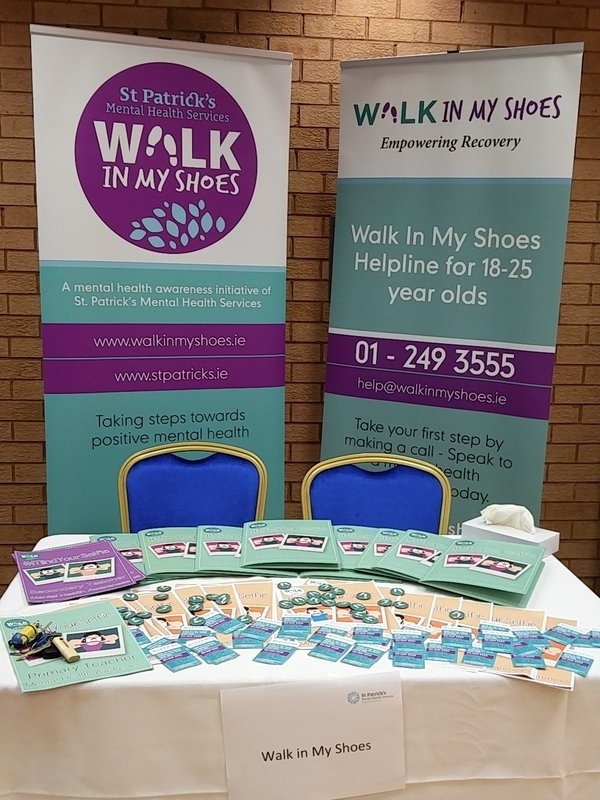 On Saturday, St. Patrick’s University Hospital together with the “Walk in My Shoes” charity held their first Mental Health and Wellbeing Fair here in Dublin 8. The first of the Mental Health Roadshow Fairs were held in Cork in February. The Fair took place inside the hallways of the hospital with information stalls lined up against the walls. Charities and organisations like YES, Shine, Samaritans, Get Ireland Walking and the Dean Clinic Dublin were there to inform the public of their services. Five different workshops were running throughout the morning. There were Yoga, Laughter Yoga, Zumba, Mindfulness and Drumming sessions held until 3pm and most of the visitors at the Fair took up a class or two while they strolled around. It was good in the way that all of the services you would want to access if you had a mental health disorder were there in one location. If you have ever wondered how to access help, this fair is one sure way to get your foot into the door, with service providers and counselors at tables ready there to assist, inform and advise you on the best way to get healing. I decided to do one of the workshops, and went for a laughter yoga class. The class was only 30 minutes long, but it was the most fun I have had in a long time. Our instructor, Theresa McAuliffe, explained to us how laughing for only 10 minutes a day can release 72 hours of endorphins ( for those of you who don’t know, it is the hormone in the brain that makes us happy and content). She told us how you don’t have to be laughing for real, just pretending that you are laughing also releases the hormone. But after a while I couldn’t stop myself from really laughing. Laughter is contagious and so is make believe laughter and it truly is the best medicine in the world. Theresa had us pretending that we were starting up lawnmowers and laughing while we were mowing our imaginary lawns. The idea throughout the session was to go up to the others in the room and to laugh out loud when you see them. It felt a bit strange at first, but after a while you get the idea. Then there were speakers and question and answer sessions presented in the lecture hall, hosted by Alan Shortt. The mental health experts shared their thoughts and experiences with depression and anxiety with the audience. I hope we will see more of these kind of fairs in Dublin, they are necessary and important for educating us on ways to cope with mental health issues.